The two pass each other briefly. Boy Student and Girl Student have switched places. It's nice to help people. Office Worker is at 3 Goodwill. Girl Student is at 2 Goodwill. 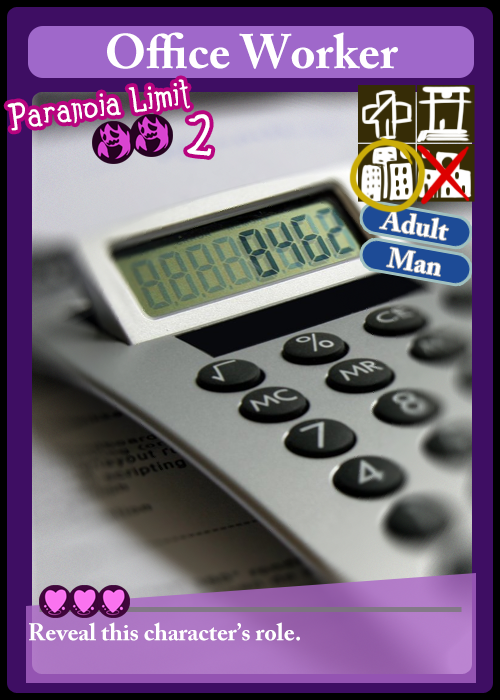 The Mastermind has played Paranoia +1 on Boy Student and Shrine Maiden. 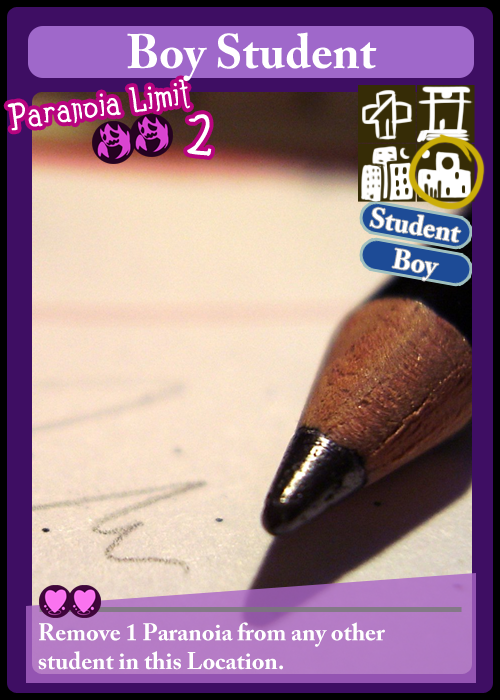 Boy student has 1 Paranoia. No Mastermind abilities are used. 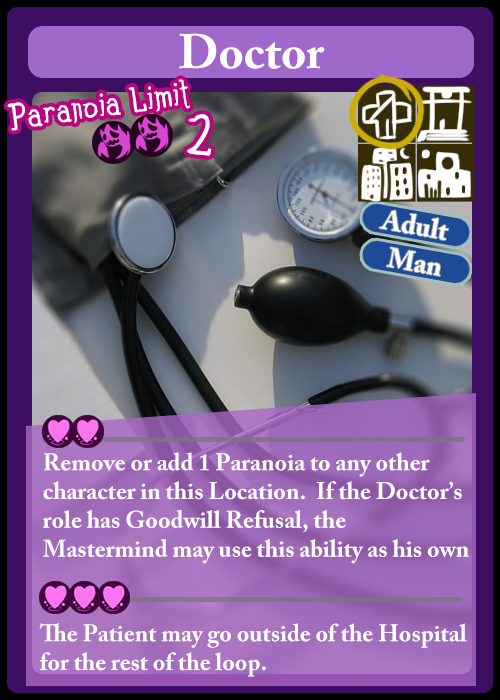 Goodwill abilities are available! Palamedes may choose to use them. I'm going to use them yeah. Office Worker, tell me your secrets! Girl Student, calm the Shrine Maiden the hell down! Office Worker is.... a Person. Shrine Maiden is no longer panicked. There is no Incident scheduled. Granolaman is the new leader. Day 3 - A Hospital Incident is scheduled. 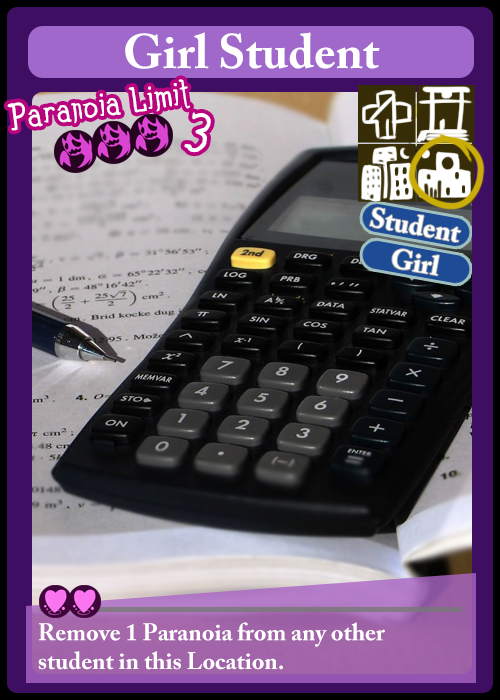 Cards have been played on Boy Student, Shrine Maiden, and Girl Student. Play order is Granolaman, Reecer6, Palamedes. Placing card on Shrine Maiden. 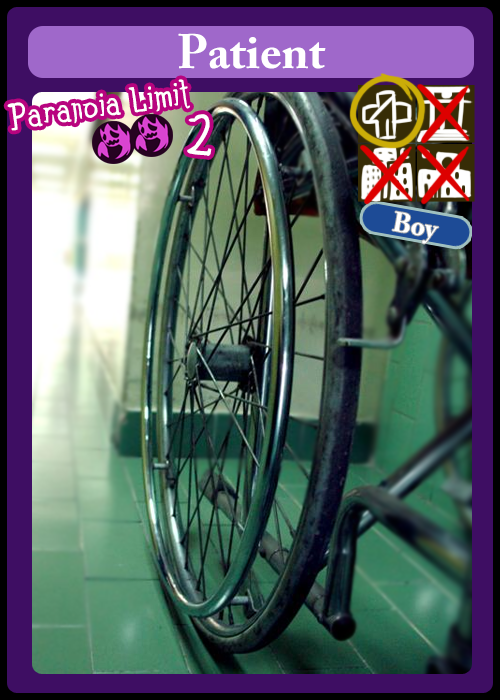 Card on the boy student. The girl overwhelmingly feels like she needs to be in town for some reason. Girl Student has moved to the City. She decides it's time to return home, to calm down a bit. Shrine Maiden has moved to the Shrine, and has 0 Paranoia. Boy Student still has 1 Paranoia. Boy Student gains 1 Paranoia. No Goodwill abilities have valid targets. YOU HAVE LOST. RETURNING TO TIME SPIRAL. hey let's have a refresh of where we start here, sorry about the killing you all thing we cool? and as a quick note about the whole incident thing, all those events happened at the same time -- the patient dying, the doctor dying, and the protagonists dying. It did happen prior to the changing of leaders, so Granolaman will continue as Leader at the start of the next loop. well, we at least know shrine maiden's a conspiracy theorist. could've learned if the boy were a friend or not if i had moved him into the hospital, but then, i didn't know shrine maiden was a conspiracy theorist!! Damn, sorry about screwing up getting the girl student killed. So unless I grossly misunderstand things we just have to keep the boy student sane and away from the shrine maiden and we don't have to worry too much about the hospital incident? Sorry for disappearing there. 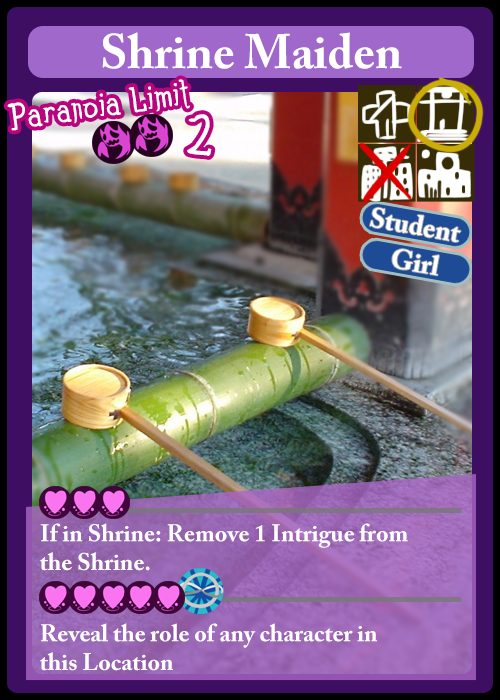 I'm not 100% convinced the Shrine Maiden is the conspiracy theorist and not the Boy Student but it doesn't hurt to keep them separated. I suspect the Girl Student is the friend though (or at least RL is committed to pretending she's the friend). If we boost her goodwill and keep her hanging out with the Boy Student we shouldn't have any more hospital problems I think. Office Worker is confirmed bystander so we're back to only needing to worry about the school and hospital again. How does moving the Boy Student into the Office, boosting the goodwill on Girl Student and leaving one person on Intrigue management (I can do it again if we need it) sound? Anyone have any ideas on how to discern Cultist v Brain at this point? Boy student being the conspiracy theorist AND the culprit of the Hospital Incident would be pretty troubling, but yeah as long as we keep the girl student near him to make him feel better we should be okay? Plus if we keep the Shrine Maiden and Boy Student separate we might be able to confirm which of them is the conspiracy theorist. If you want to do intrigue duty again I'd say go for it. Best way to figure out if the cultist is around is to just keep using forbid intrigue I think. Holidays are over! We'll get this going on Saturday, I think. The Time Spiral wavers. Yeah, good job space-time. Way to put in the holiday effort!